Dennis M. Lox, MD, an expert in Sports and Regenerative Medicine has been using the patients own stem cells to treat avascular necrosis (AVN) also known by other names such as osteonecrosis, aseptic necrosis, or ischemic necrosis. Avascular necrosis (AVN) occurs when an area of blood supply to the bone is disrupted (avascular), and this leads to a region of bone cell death (necrosis). The most devastating aspect of AVN occurs when the area of necrotic bone collapses and severe degeneration of the joint occurs. Dr. Lox has used stem cells to treat AVN by using the patients own stem cells and directly injecting into the area of necrosis. 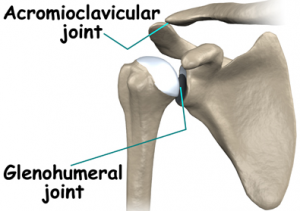 The shoulder is the second most frequent joint involved. It usually occurs as a result of trauma, however many other causes including excessive cortisone use can be associated with the development of AVN. A patient with traumatic induced AVN consulted Dr. Lox early in the course of shoulder symptoms. The avascular necrosis was diagnosed early and consultation with Dr. Lox was arranged as the patient did not wish to have shoulder joint replacement. Their was no shoulder joint collapse and the patient elected to have stem cell therapy. The shoulder pain resolved afterwards. The joint has been stable with no signs of joint collapse at followup. Patients find the prospect of stem cell therapy for avascular necrosis to be a viable option in certain cases as shoulder joint replacement has significant ramifications for younger patients and athletes who develop AVN. Note: not all patients respond the same to any medical procedure. Each patient must be individually evaluated and an appropriate treatment course for each patient is discussed. Case studies are for educational purposes and not meant to imply results for any patient. Dennis M. Lox, MD, serves patients in the greater Tampa Bay area, including, Clearwater, St. Petersburg, Tampa, New Port Richey, Sarasota, Orlando and Spring Hill. He has been pleased to accommodate the needs of patients throughout Florida, the United States, the Western Hemisphere, and Europe, as well. Located in the 33765 area, our office can be reached at (727) 462-5582.